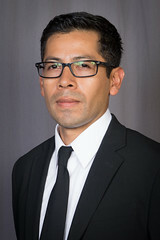 Dr. Espinoza’s research interests include mechanics and physics of natural porous solids, methane recovery from microporous organic rocks, methane hydrate-bearing sediments, and geological carbon sequestration. His methodology combines laboratory techniques and advanced imaging tools to understand and model diverse geomaterials for petroleum engineering applications. James Lai Outstanding MSc Student Award, Geosystems - Georgia Institute of Technology, 2009. Assistantship for Undergraduate Final Project, Agencia Cordoba Ciencia, 2005. Waite W. F., Santamarina J. C., Cortes D. D., Dugan B., Espinoza D. N., Germaine J., Jang J., Jung J., Kneafsey T., Shin H. S., Soga K., Winters W., and Yun T-S., (2009), “Physical properties of hydrate-bearing sediments”, Review of Geophysics, 47, RG4003, doi:10.1029/2008RG000279. Espinoza D. N. and Santamarina J. C., “Water-CO2 -mineral systems : interfacial tension, contact angle and diffusion - Implications to CO2 geological storage”, (2010), Water Resources Research, 46, W07537, doi:10.1029/2009WR008634. Jung J., Espinoza D. N. and Santamarina J. C., “Properties and phenomena relevant to CH4 -CO2 replacement in hydrate-bearing sediments”, (2010), Journal of Geophysical Research-Solid Earth, 115, B10102, doi:10.1029/2009JB000812RR. Espinoza D. N. and Santamarina J. C., “P-wave monitoring of hydrate-bearing sand during CH4 -CO2 replacement”, International Journal of Greenhouse Gas Control, 5(4), p1031-1038, doi:10.1016/j.ijggc.2011.02.006. Espinoza D. N., Kim S. H. and Santamarina J. C., “CO2 geological storage - Geotechnical implications”, (2011), KSCE Journal of Civil Engineering - Special issue : Energy Geotechnology, 15(4). Espinoza D. N., and Santamarina J. C., “Clay interaction with liquid and supercritical CO2 : The relevance of electrical and capillary forces”, International Journal of Greenhouse Gas Control - Accepted.